In this tutorial, you will learn how to use the TapFly and ActiveTrack Missions of DJI iOS SDK to create a cool application for DJI Mavic Pro. Also, you will get familiar with DJITapFlyMissionOperator, DJIActiveTrackMissionOperator and using the Simulator of DJI Assistant 2 for testing, which is convenient for you to test the missions indoor. So let's get started! The TapFly and ActiveTrack missions bring you a more autonomous flying experience. They are originally supported by Phantom 4, now they are also supported by Mavic Pro, Phantom 4 Pro, Phantom 4 Advanced, Spark, M200 and Inspire 2. Given a coordinate in the live video stream (which can come from a user tap), the aircraft will calculate and fly towards the coordinate's direction in the real world. During a flight, the aircraft will automatically detect and avoid obstacles. Also, the aircraft will stop flying in the direction if it reaches its radius limitation, the mission is stopped, the user pulls back on the pitch stick or if it comes to an obstacle it cannot bypass. During the mission, you can use the remote controller's yaw stick to adjust the heading of the aircraft, which also adjusts the direction of flight to the new yaw. Here is a video for you to get the first impression of the TapFly Mission. The main camera is used to track the target, so the gimbal cannot be adjusted during an ActiveTrack mission. During the mission, the aircraft can be manually flown with pitch, roll and throttle to move around the subject being tracked. Here is a video for you to get the first impression of the ActiveTrack Mission. Now, let's create a new project in Xcode, choose Single View Application template for your project and press "Next", then enter "P4Missions" in the Product Name field and keep the other default settings. Once the project is created, let's delete the ViewController.h and ViewController.m files, which are created by Xcode when you create the project. Then create a UIViewController named RootViewController and set the class of original ViewController object to "RootViewController" and make the ViewController embed in a Navigation Controller and set it as the Storyboard Entry Point in Main.storyboard. You can check the Creating a Camera Application tutorial to learn how to download and import the DJIWidget into your Xcode project. Drag and drop two UIButton objects to the RootViewController and named them as "TapFly Mission" and "ActiveTrack Mission". Remember to add Auto Layout constraints to the two buttons. Moreover, drag and drop two UIViewController objects from the Object library and place them on the right of the RootViewController. Control drag from the two buttons to the two new UIViewController objects separately and choose the "Show" action segue. Here we create two UIViewController classes and named them as "ActiveTrackViewController" and "TapFlyViewController". Then set the class of the two new UIViewController objects in storyboard as these two classes. Next, drag two Bar Button items(Name them both as "Status") from Object Library and place them on the right side of navigation bar of "ActiveTrackViewController" and "TapFlyViewController" objects in the storyboard. It looks pretty simple and clear, this will be the workflow of our demo application. Before we dive into the implementation of two missions, let's learn something about the special coordinate transformations of them. 1. The direction property is a DJISDKVector3D object, which represents a cartesian vector in 3D space. You can get the actual flying direction of the aircraft using the N-E-D(North-East-Down) coordinate system when the aircraft is executing a TapFly mission. 2. The imageLocation property is the image point from the live video stream where the vision system should calculate the flight direction from. The image point is normalized to [0,1] where (0,0) is the top left corner and (1,1) is the bottom right. As the diagram shown above, you can see the process of transformation. The imageLocationToCalculateDirection property shown above is transformed from TouchPoint (CGPoint) to a Video Stream Coordinate System CGPoint. The direction property shown above belongs to the N-E-D (North-East-Down) Coordinate System and will be sent to you by the SDK. The imageLocation property shown above belongs to the Video Stream Coordinate System and will be sent to you by the SDK. Next, let's check the DJIActiveTrackMission.h file, you may see the following two properties. 1. The targetRect property in the DJIActiveTrackMission interface is a bounding box for the target. The rectangle is normalized to [0,1] where (0,0) is the top left of the video preview and (1,1) is the bottom right. The size parameter of CGRect can be set to 0 to initialize the mission with a point instead of a rectangle. If the mission is initialized with a point, the vision system will try to recognize the object around the point and return the representative rect in the status delegate. 2. Another targetRect property in the DJIActiveTrackTrackingState interface is a rectangle in the live video view image that represents the target being tracked. The rectangle is normalized to [0,1] where (0,0) is the top left of the video preview and (1,1) is the bottom right. The two targetRect properties shown above belongs to the Video Stream Coordinate System. So in order to implement the ActiveTrack Mission, we should transform the user's touch rect (A CGRect object) of UIView Coordinate System into the tracking rect (A CGRect object) of Video Stream Coordination System and pass it to the targetRect property of DJIActiveTrackMission interface. The SDK will send you the targetRect property of DJIActiveTrackTrackingState interface to update the rectangle on your screen. Now let's create a new UIView class and name it as "PointingTouchView". We use this UIView to update and draw the tapping point of the direction which you want the aircraft to fly towards on the screen. Remember to place the fpvView at the bottom, and change the top UIView object's class to "PointingTouchView". *  Fetch DJI Project's component Objects. *  Help to do the coordinate transformations. *  Returns the string object from related enum values. It firstly imports the DJISDK and DJIVideoPreviewer header files, then defines several methods to do the mission coordinate transformations. The "StreamSpace" in the above method names means the video stream coordinate system. Those methods include transformations of CGPoint, CGSize and CGRect, we will use them frequently later. For the remaining implementation of this class, please check this tutorial's Github sample project. Here, we create two methods to update the touching point and its color. In the code above, we implement the updatePoint: and updatePoint:andColor: methods to update the point and fillColor instance variables. Moreover, we implement the -(void)drawRect:(CGRect)rect method to draw a circle and fill it with color for the touching point on the PointingTouchView. In the onScreenTouched: method, we firstly get the CGPoint of touch event by invoking the locationInView: method of UIGestureRecognizer. Then we invoke the updatePoint:andColor: method of PointingTouchView to draw the point with green color on the screen. Lastly, we call the pointToStreamSpace:withView: method of DemoUtility to transform the touch point to a Video Stream Coordinate CGPoint object and pass it to the startTapFlyMissionWithPoint: method to configure the TapFly mission. We will implement this method later. You can set the aircraft's auto flight speed during the mission by invoking the setAutoFlightSpeed:withCompletion: method of DJITapFlyMissionOperator. The range for it is [1, 10] m/s. If you want to allow the aircraft to bypass or move around an obstacle by going to the left or right of the obstacle when executing TapFly mission, you can invoke the setHorizontalObstacleBypassEnabled:withCompletion: method of DJITapFlyMissionOperator and pass YES as the parameter. Otherwise, the aircraft will only go over an obstacle to avoid it. First, we create the missionOperator method to fetch the DJITapFlyMissionOperator object from DJIMissionControl. Next, in the isExecutingState: method, we check the enum values of the DJITapFlyMissionState and return a BOOL value. Moreover, in the isMissionRunning method, we fetch the currentState object from the DJITapFlyMissionOperator, invoke the isExecutingState method and return a BOOL value to identify if the TapFlyMission is executing. In the updateBypassStatus method, we invoke the getHorizontalObstacleBypassEnabledWithCompletion method of DJITapFlyMissionOperator and update the bypassSwitcher value in the completion block. Similarly, in the updateSpeedSlider method, we invoke the getAutoFlightSpeedWithCompletion: method of DJITapFlyMissionOperator and update the speedLabel's text value and the speedSlider's value in the completion block. Furthermore, in the onSliderValueChanged: IBAction method, we invoke the setAutoFlightSpeed:withCompletion: method of DJITapFlyMissionOperator to dynamically set the flight speed for the tap fly mission. In the completion block, we invoke the updateSpeedSlider method to update the values of speedLabel and speedSlider. Lastly, in the onSwitchValueChanged: IBAction method, we invoke the setHorizontalObstacleBypassEnabled:withCompletion: method of DJITapFlyMissionOperator to enable or disable the horizontal obstacle bypass feature of tap fly mission. In the startTapFlyMissionWithPoint: method, we firstly initialize the tapFlyMission object and then set the imageLocationToCalculateDirection value of DJITapFlyMission as the CGPoint point. This imageLocationToCalculateDirection property is where we should pass the coordinate transformation CGPoint to do the coordinate transformation. It is also the image point from the video feed where the vision system should calculate the flight direction from. Next, set the tapFlyMode property of DJITapFlyMission as DJITapFlyModeForward enum value, for more details, please check the DJITapFlyMode enum in DJITapFlyMissionTypes.h header file. Lastly, invoke the shouldShowStartMissionButton method to show the start mission button. Here, we invoke the startMission:withCompletion: method of DJITapFlyMissionOperator to start the tap fly mission. If we start the tap fly mission successfully, invoke the shouldShowStartMissionButton: method to hide the startMissionBtn and show the stopMissionBtn. Otherwise, invoke the updatePoint: method of PointingTouchView to reset the touch point circle. During the TapFly mission execution, we can add a listener to receive the mission events for status infos. You can use this status infos to inform users or update the UI interface. Here, we create the statusView to show the tap fly mission status infos, and create the logString to store the log infos. In the code above, we initialize the statusView firstly, then invoke the addListenerToEvents:withQueue:andBlock: method of DJITapFlyMissionOperator to add TapFlyViewController as the listener to receive the events of the TapFly mission. In the completion block, we invoke the didReceiveEvent: method and pass the received event variable as the parameter to it. We invoke the isExecutingState: method to check if the TapFly mission is either "Resetting", "Paused" or "Executing", if so, we show the stopMissionBtn, otherwise, we reset the point property in the PointingTouchView and hide both the startMissionBtn and stopMissionBtn. Next, check if the TapFly mission is stopped and show alert view to inform users with errors if they exist. Furthermore, check if the executionState exists, then get the image point from the video feed and invoke the pointFromStreamSpace: method of DemoUtility to convert it to the iOS UIView coordinate system. Then with the point object, we can update the circle's position and color drawing on the screen based on the executionState. Store the TapFly execution state infos into the logString and show it in the statusView. 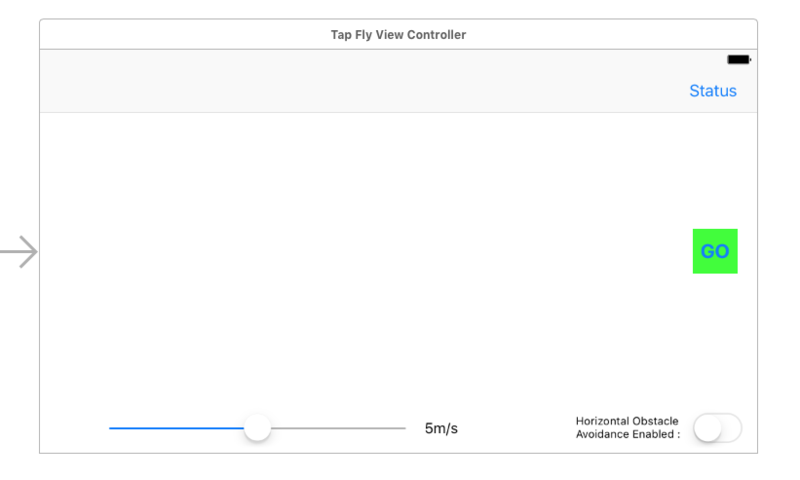 For more implementation details of the TapFlyViewController file, please check the Github source code. Now let's build and run the project, if everything goes well, you should be able to use the TapFly mission now. Important: Remember to switch the remote controller to P mode before you test the TapFly mission. In the animation, when you tap on the screen, a green circle appears, which is the direction you want Mavic Pro fly towards. Press the GO button on the right side, Mavic Pro will start to execute the TapFly mission and fly. When you want to stop the mission, just press the X button, Mavic Pro will stop immediately and hover there. 1. Now let's create a new UIView class and name it as "TrackingRenderView". We use this UIView to track the user's UITouch Event and draw the tracking rectangle of the object on it. Remember to place the fpvView at the bottom, and change the top UIView object's class to "TrackingRenderView". 1. Firstly, we create two TrackingRenderViewDelegate methods, they are used to track your single touch event and drawing rectangle touch event. 2. We use the trackingRect property to store the updated tracking CGRect of moveing subject and draw it on the TrackingRenderView. The isDottedLine BOOL value is used for drawing dotted line. The text NSString property is used to store and draw text on the TrackingRenderView. 3. Lastly, we create the updateRect:fillColor: method to update the tracking rect and fill its color. Here, we implement the four event-handling methods for touches to track user's multi touch and invoke the related TrackingRenderViewDelegate methods. Also, we implement the -(void)drawRect:(CGRect)rect method to draw the tracking rectangle, dotted line and text on the TrackingRenderView. Gesture mode allows the subject to confirm tracking as well as take pictures using gestures. Raise your arms in a V, the human subject can accept the confirmation to track them. Gesture mode can only be enabled when the aircraft is flying but not tracking a target. If the aircraft is already tracking a target, disabling gesture mode will stop the ActiveTrack mission. You can check this video to get a better understanding of the Gesture Mode. 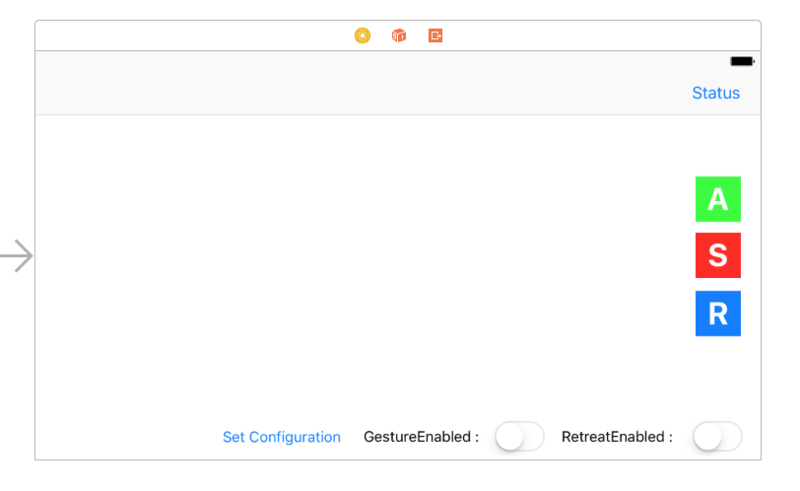 In the code above, we invoke the setGestureModeEnabled:withCompletion: method of DJIActiveTrackMissionOperator to set the gesture mode, and invoke updateGestureEnabled method to update the gestureSwitch value in the completion block if set geature mode successfully. When retreat is enabled, the aircraft will retreat (fly backwards) when the target comes toward it. When it is disabled, the aircraft will not retreat and instead rotate the gimbal pitch down to track the target as it goes underneath. If the target goes beyond the gimbal's pitch stop, the target will be lost and the mission will stop. As you see the code above, we invoke the setRetreatEnabled:withCompletion: method of DJIActiveTrackMissionOperator to enable the retreat feature. Also, in the completion block, if set retreat enable successfully, we invoke the updateRetreatEnabled method to update the retreatSwitch's "on" value. Using this feature, we can set the recommended camera and gimbal configuration that optimizes performance for the ActiveTrack Mission in most environments. Here, we can invoke the setRecommendedConfigurationWithCompletion: method of DJIActiveTrackMissionOperator to set the recommended camera and gimbal configuration. Then show alert views to inform users in the completion block. 1. The ActiveTrack Mission can track both moving subjects and humans. For moving subjests, you need to provide a CGRect struct of tracking rectangle to the DJIActiveTrackMission object's rect property. For humans, you can either provide a CGRect struct of tracking rectangle or a CGRect struct with just CGPoint. Like you can tap on the human on your iPhone's screen. If you draw a tracking rectangle on a moving subject, and the vision system need to confirm it, you can touch the rectangle and invoke the acceptConfirmationWithCompletion: method of the DJIActiveTrackMissionOperator, if you want to cancel the tracking, you can touch outside the rectangle, and invoke the stopMissionWithCompletion: method. Moreover, the renderViewDidMoveToPoint:fromPoint:isFinished: delegate method get invoked when user try to draw a rectangle on the screen to track moving subject. You can get the startPoint and endPoint from the delegate method and invoke the DemoUtility's rectWithPoint:andPoint: method to convert them to a CGRect object. When you finish drawing the rectangle, invoke the startMissionWithRect: method to start the mission. In the code above, we firstly invoke the rectToStreamSpace:withView: method of DemoUtility to transform the drawing rectangle to a Video Stream coordinate rectangle, call it normalizedRect. Then create the DJIActiveTrackMission instance object and pass the normalizedRect to its targetRect property. If start mission failed, we reset the drawing rect in the renderView and show alert view to inform users. In the code above, we initialize the statusView firstly, then invoke the addListenerToEvents:withQueue:andBlock: method of DJIActiveTrackMissionOperator to add ActiveTrackViewController as the listener to receive the events of the ActiveTrack mission. In the completion block, we invoke the didUpdateEvent: method and pass the received event variable as the parameter to it. We get the previousState and currentState properties from the received DJIActiveTrackMissionEvent, then use them to check if the mission is interrupted and shows alert view to inform users with related errors. Next, we get the targetRect in the live video feed from DJIActiveTrackTrackingState object and invoke the rectFromStreamSpace: method to transform it to the tracking rectangle (A CGRect object) of UIView Coordinate System. If the target state is DJIActiveTrackTargetStateWaitingForConfirmation, we show the "?" text to inform users to confirm the tracking subject. Moreover, use different color to represent different DJIActiveTrackTargetState and invoke the updateRect:fillColor: method of TrackingRenderView to update the TrackingRenderView's rectangle drawing and filling color. Lastly, we store different mission state infos in the logString object and show them in the statusView. For more implementation details of the ActiveTrackViewController.m file, please check the Github source code. Now let's build and run the project, if everything goes well, you should be able to use the ActiveTrack mission of Mavic Pro now. Important: Remember to switch the remote controller to P mode before you test the ActiveTrack mission. In the animation, you can see there is a person standing there, you can touch the screen to draw a green rectangle on him. Then the rectangle will turn orange and a question mark will appear to ask you for confirmation. You can press the A button on the right side to accept the confirmation. After the confirmation, the ActiveTrack mission starts. The person walks around and the green rectangle will follow it to track its movement. This means that Mavic Pro is now tracking you automatically! You can press the R button to stop the aircraft from following you and ask for your confirmation again. Also, press the S button if you want to stop the ActiveTrack mission. Moreover, if you switch on the GestureEnabled switcher at the bottom of the screen, you will enable the gesture mode of Mavic Pro. Raise your arms in a V, Mavic Pro will recognize you and start to track you automatically. Lastly, you can try to switch on the RetreatEnabled switcher at the bottom right corner of the screen to enable the Retreat feature. Once you go towards the Mavic Pro, it will fly backwards. Since most of our developers don't have a perfect testing environment, like a big indoor space, wide backyard, etc. If we need to go outdoors and bring our laptop to debug and test our application everytime, it's time consuming and not efficient. Luckily, we have a new DJI Assistant 2 (Includes the 3D Simulator) for you to test the mission easily on your Mac. The simulator creates a virtual 3D environment from flight data transmitted to the Mac. You can check the Using DJI Assistant 2 Simulator for its basic usage. Now you can connect your iPhone which is running the demo application to the remote controller, and start to test the TapFly and ActiveTrack missions on the simulator of the DJI Assistant 2. Moreover, another good news is you can use the DJI Bridge App to test the application directly on the iOS Simulator! If you are not familiar with the DJI Bridge App, please check the DJI Bridge App Tutorial. Now, make sure your Mac and your iPhone(Running DJI Bridge App) connect to the same WiFi network, pass the Debug ID on the DJI Bridge App to the enableBridgeModeWithBridgeAppIP: method. Build and run the app on the iOS Simulator with Xcode, control the remote controller to take off the aircraft in the simulator. You can start to test the TapFly and ActiveTrack mission directly on your Mac now! Congratulations! You've finished the demo project and implement the two cool TapFly and ActiveTrack missions using DJI Mobile SDK. It's easy and straightforward. You've learned how to use the DJITapFlyMission, DJIActiveTrackMission, DJITapFlyMissionOperator and DJIActiveTrackMissionOperator to implement the features. Also, you know how to setup and use the simulator of DJI Assistant 2 and DJI Bridge App to test the two missions on your Mac easily. But, In order to make a cool TapFly and ActiveTrack mission application, you still have a long way to go. You can add more necessary features like showing the battery percentage, GPS signal quality, add a checklist like DJI Go app to check the aircraft status before flying, etc. Good luck and hope you enjoy this tutorial!